Stewart R: Wow, what a week for the new stuff! 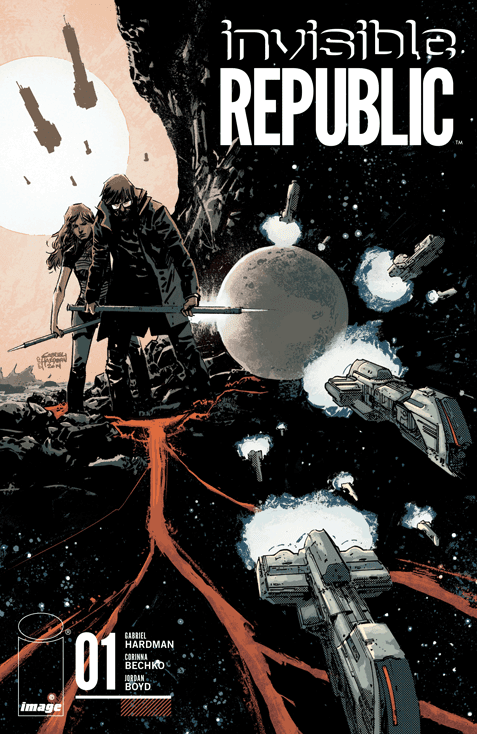 There's a horde of new books heading my way this week and they're led by Gabriel Hardman and Corinna Beckho's Invisible Republic #1. I put this title in the spotlight for Ten Forward back in January and my hunger for its secret history plot remains strong to this day. I do have a soft spot for Hardman's art and I've no doubt that as a creative team, he and Beckho will bring their best work in terms of script and plot! Then there is of course the Mark Millar and Sean Murphy team up in Chrononauts #1 which will no doubt have some big screen potential lurking within the pages as Millar is a writer who seems to angle that way, while Murphy's visuals lend themselves well to transitional ideas of live action-adaptation. I've been reading Red Moon Rising recently which tracks the American and Russian steps into the space race, so Red One #1 from Xavier Dorison and Terry Dodson definitely appeals with its own Cold War hook, with their book looking at the repercussions of America's greatest hero of the 1970s turning out to be a Soviet spy! And the new titles don't end there! I'll be giving Shaper #1 from Dark Horse a punt too as well as picking up Batgirl: Endgame #1 to look for Bengal's exceptional art work! Tom P: What a great week in comics for me! Let's start with Dark Horse. We've got the time-travelling Ei8ht #2 and Mike Mignola's new take on 'the Monster' in Frankenstein Underground #1 - any new book from the Hellboy horror maestro is always a highlight for me. DC is up next with the trendy Batgirl #40 which I've been enjoying; I really dig the new direction and the same could be said of Superman #39 which boasts the killer creative talents of Geoff Johns, John Romita and Klaus Janson. Over at Image I've got C.O.W.L. #9 waiting for me. I picked the trade up on Matt C's recommendation and I've been hooked ever since. It's pure class. Red One #1 will be a must buy as I'm quite a fan of Xavier Dorison a star of the French comics scene whose writing I've followed since I picked up his Long John Silver series via Cinebook. The premise had me hooked, what happens when America's greatest hero... is a Russian spy? SOLD. Top of the pile this week will undoubtedly be Chrononauts #1 from Sean Murphy and Mark Miller. Now that's a team up! When Miller gets it right few can touch him and Murphy can't draw a bad panel as far as I'm concerned. I can't wait to see the results.